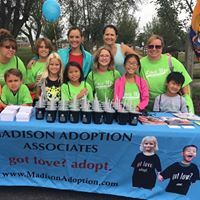 Madison Minutes is the monthly email newsletter of Madison Adoption Associates. This newsletter provides updates on the programs, activities and events going on at MAA. We also try to provide information on current issues in international adoption, interesting stories, new resources, and other relevant articles. Our favorite part of each issue of Madison Minutes is our Welcome Home section that lists the families who have recently come home with their new children. Sign up today to receive Madison Minutes! Madison Adoption – New Referrals!! Ambassadors of Hope Program – GRANTS!